In 1955 Bishop Babin was born in Lafayette LA. He moved to California and graduated from Mt. Carmel Catholic All Boys School in Los Angeles, California. In 1962 he attended Holy Name Catholic School and he heard the voice of God as an alter boy. In 1974 he was in the US Marine Corps. He has been married to his beautiful wife Cookie for 42 years, they have three beautiful children, two boys and a girl and four grandchildren. In 1976 he attended Palomar College and from there received a Scholarship to Portland State University for basketball, then turned pro and went to France and became a professional basketball player. He was then drafted by the Los Angeles Clippers and played in the summer MBA league. Instead of pursuing his basketball career he chose to respond to the voice and that voice was the voice of God. Bishop was called out of his secular job and began the ministry on the streets of Oceanside in the downtown red light district area. He continued touching people with the love and the power of God. In 1984 he started a Coffee Shop & Christian Bookstore with free coffee and donuts for the homeless. In 1986 he started the church in the bookstore, which is in existence to this day and known as Genesis Ministries International. 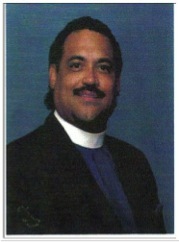 In 1989 he was ordained a Pastor under Chapel Hill Harvester Church in Atlanta, Georgia presiding Arch Bishop Earl Paulk. In 1997 he was appointed a Bishop in England; his ordination is under the (ICCC) International Community of Charismatic Churches. Also Bishop Babin is a prophet to the (CAC) Community of Apostolic Churches and the (AMI) Apostolic International Center under the direction of Arch Bishop George Kouri. In addition he is affiliated with the Prophet Kim Clement with Prophetic Image Express and has traveled around the world with him since 1986. In 1999 he received his Masters in Theology at Vision International University under Dr. Stan DeKoven. In 2014 he received his Doctorate in Theology at the Apostles Theological Seminary under Archbishop George Kouri. Bishop Babin has established churches all through Africa, Pakistan and the Philippines. His heart has always been for people to feel and experience what he feels. He feels the love of God; from the least to the greatest, from the streets to Corporate America and unto Capitol Hill. The vision God has shown Bishop Babin is for the city Oceanside to be a model city for all the Nations. The kingdom of God suffers violence and the violent take it by force.